Fractional distillation process is the separation of a mixture into individual parts of fractions by heating it up. 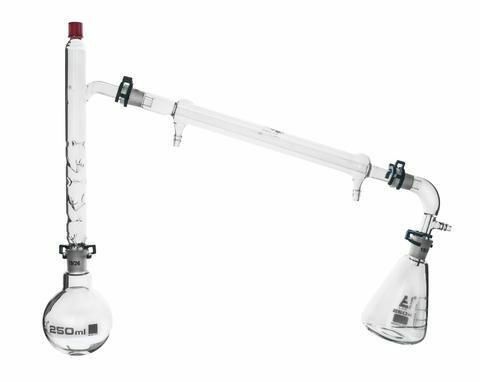 Delivery information: Kit includes 250 ml Erlenmeyer flask (1), 250 ml round bottom boiling flask (1), Vigreux column (1), Liebig condenser (1), receiver adapter vacuum (1), joint clips (4). Clamps, stand, thermometer or Bunsen burner are not included with this kit.